Lollapalooza is an annual music festival featuring popular alternative rock, heavy metal, punk rock, hip hop, and EDM bands and artists, dance and comedy performances and craft booths. It was conceived and created in 1991 by Jane’s Addiction singer Perry Farrell as a farewell tour for his band. The font used for the logo of the music festival is very similar to Lolapeluza. Designed by RodrigoTypo from Chile, Lolapeluza is a cheerful and entertaining typeface inspired by the logo itself. The typeface comes in 4 variants, including Regular, Black, Shadow and Line, which can be layered over each other to create various visual effects. 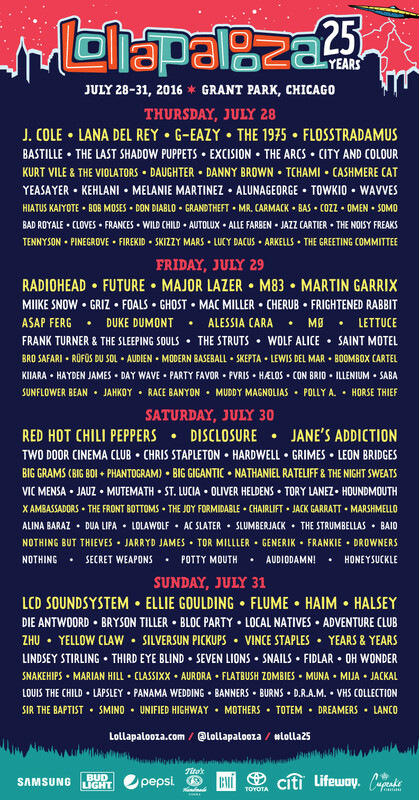 Lollapalooza’s 25th anniversary will come in the summer of 2016 and below is the lineup poster for the four-day event from July 28th through the 31st. The fonts setting the text in the poster are FF Prater Serif and FF Frater Sans, both designed by German type designers Henning Wagenbreth and Steffen Sauerteig.